LABAlive is a unique celebration of art, theater, and Jewish texts. 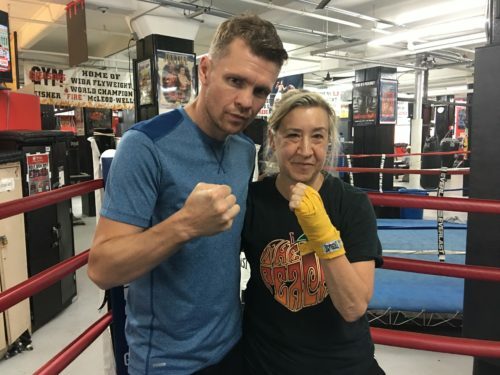 This Thursday, May 31st, at 7.30pm, playwright Amy Handelsman will be showing an excerpt from her work-in-progress, LOVE BY TKO: Life Lessons in the Ring (theatrical excerpts from my memoir). (Click here for tickets!) Below, Amy describes her thoughts on boxing and Judaism. Common wisdom supports creating conditions for peace wherever possible, but I’ve never shied away from confrontation. If not actually belligerent, I am scrappy by nature. I’ve walked into punches and thrown a few myself. So this year’s LABA theme of War & Peace fits snugly into my psychic armature. I’ve been grappling with these themes for a while. Grappling is a good word to mine, and one that embraces—to me—what is most non-dogmatic and profound about Judaism: The word Israel itself means “G-d wrestler,” the name ascribed to Jacob on that fateful night before going to meet his twin Esau, after stealing his brother’s birthright and years of estrangement. Here’s the story: Jacob, by now a rich man, divests himself of his possessions and lays down by the river Jabbok, where he is visited by an enigmatic ish, a man. Different midrashim have different interpretations on the nature of this ish. Was it an angel, a messenger of G-d? Was it Esau’s angel, come to do battle before the brothers meet? Or, was it, as the Zohar says, the darker side of Jacob’s own nature? Was Jacob, in Jungian fashion, wrestling with his own demons? Jacob and the angel (or ish) wrestled until dawn was breaking, at which time the ish had to join his colleagues in the firmament. (Was he a vampire angel?) The angel, realizing that he could not best Jacob, touched Jacob’s thigh and dislocates it. They still grappled, locked in close embrace. The angel begged Jacob to let him go and Jacob agreed, but only on the condition that the angel bless him. The angel blessed Jacob and gave him a new name: Israel. We know throughout history, many regimes tried to eradicate the Jewish people physically and spiritually by successfully dislocating our parts; and yet, our “body” remains intact. We prevailed, despite our wounds. I like to think of this parable in a different way. 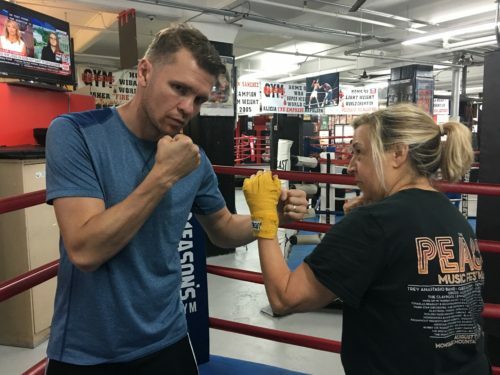 Boxing, despite its many dangers, paradoxically allowed me to not just prevail, but to thrive. I may have been on that spiritual and physical mat at times in my life, but I rose, despite being injured. Perhaps, then, it is not that we prevail despite our wounds. Perhaps it is the very wound itself that bestows the blessing. "The machine is a god for making universes"